Celebrate the heavens in your garden using the Whitehall Aluminum Sun and Moon Sundial. The tall shape, interlocking panels, and varied curved lines all combine to form an exciting timepiece for your yard. A flat disc creates the center of this item, with a smiling sun face and emanating rays lending personality to the piece. A band of numbers, from 7 AM to 5 PM, surrounds this sunburst element. A crescent shape, evoking a crescent moon, cradles the sun disc and echoes its rays for even more design. A bronze colored rod spans between the top and base of the crescent moon shape, creating a gnomon. As the sun passes overhead, the shadow cast by the gnomon falls over the hour indicators on the dial, noting the time. The copper color throughout the item offers an antique hint, contrasted by the verdigris hue on the recessed sections. The aluminum construction ensures a lasting and durable piece, and the unit can easily affix to a post or pedestal (not included) via the mounting hole at its base. Bring a celestial look to your yard with this Aluminum Sun and Moon Sundial. Made in the USA. 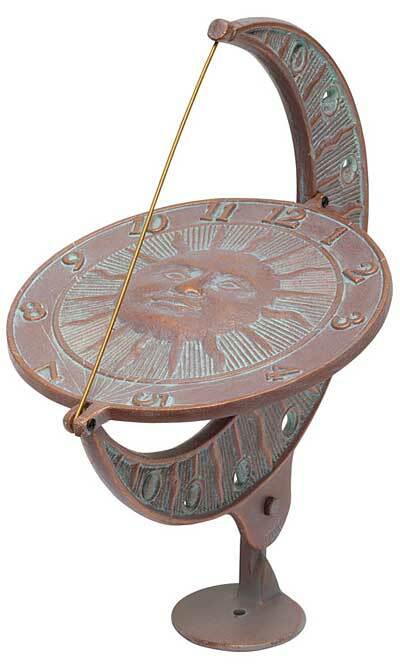 Rome Brass Sunrise & Sunset Sundial, Verdigris, 8.5" dia.